The EgglestonWorks-Triangle Art room featured a ton of impressive-looking gear, much of it branded with the distinctive Triangle Art logo. 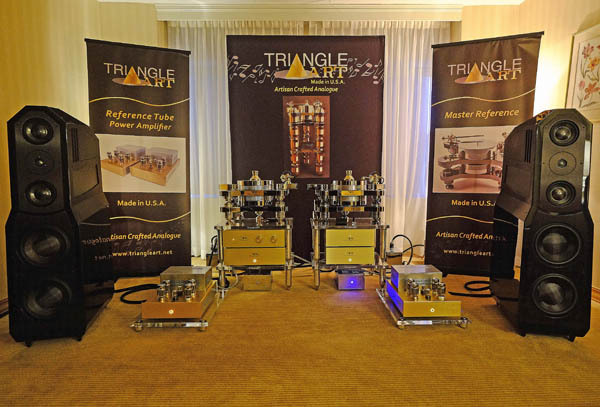 The lineup included the Triangle Art Master Reference Turntable ($39,900), Triangle Art Osiris MK2 121″ tonearm ($6800), Triangle Art Apollo MC cartridge ($8000), Triangle Art Reference Tube monoblock amplifier ($17,998 each), Triangle Art Reference tube preamplifier ($17,998), Triangle Art tube phono stage ($12998), Triangle Art RHEA Reference Interconnect ($2890), Triangle Art Reference Power Cord ($2890), and Triangle Art Reference Power cable ($4990), plus the EgglestonWorks Viginti floorstanding loudspeakers ($39,900/pair). The noise floor of the Eggleston/Triangle Art setup seemed practically nonexistent, giving the recording a spooky, spectral quality. A 2013 Sony pressing of the RCA Living Stereo LP of Rimsky-Korsakov’s Scheherazade, with Fritz Reiner conducting the Chicago Symphony Orchestra, emerged from a black background; this rig also magically escaped the Park Lane’s assorted room goblins. Coherent, whole, natural, non-forced and easy: Eggleston/Triangle Art communicated the essence of the music with little artifice or hi-fi filigreed effects. Even at what I considered the rig’s lower-than-ideal volume level, the music was lush and rich, yet dynamic and engaging. And fast.